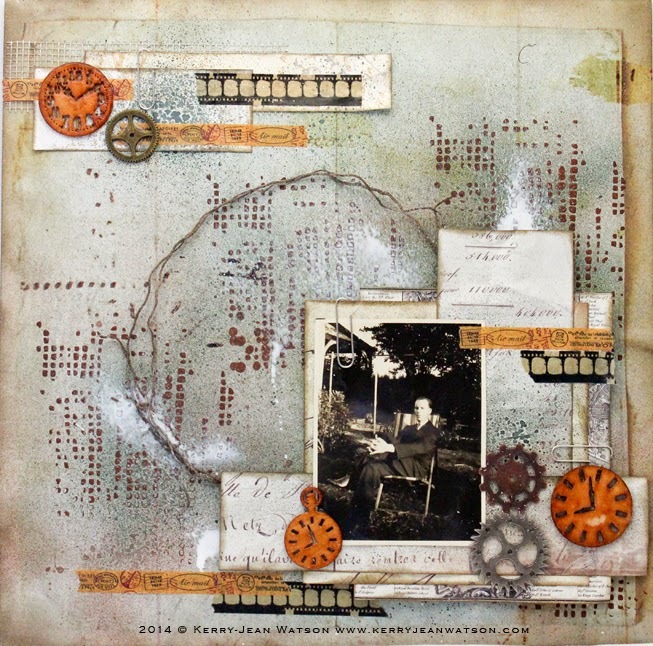 I was lucky enough to win a prize from Moments of Tranquility In the prize was the Garment District papers by Marion Smither and a large selection of Dusty Attic chippies. I have some lovely old photos of my maternal grandparents in their wedding day back in the 1930's which I left would work really well with the Marion Smith papers. I did some stenciling on the background and a tiny bit of misty just to subdue the design a little. I love all the cut outs that marion has for this collection some of which I added, along with some vintage brads I got from Meg's Garden. I would love to hear what you think about this layout. Happy crafting. Hello all you crafters out there. A few months back I gave a new technique a try. After watching a youtube clip (which if I find will tag to the end of this post) and felt it was so simple that I could give it a go. The only thing is I am not a golds and shiny fan, proffering darker tones. To achieve this I used black Gesso and followed the technique in the clip. I am very happy with the outcome with the first attempt. Let me know what you think. 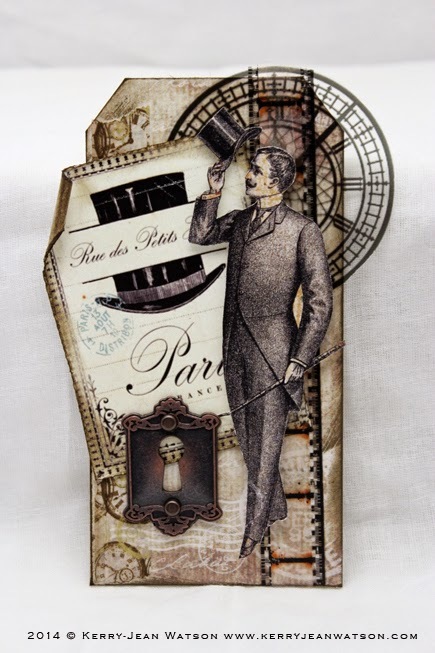 Today's post features tags created using my new collection The Gentlemen Collection that has been created through Meg's Garden. For all of these tags I have used the mini pack papers from the collection for the bases. 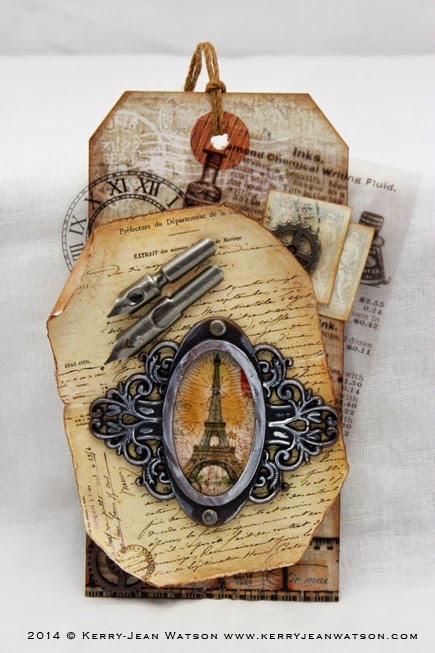 For the first two tags I wanted to go all out with masculine elements and where else do you go for this but to Tim Holtz. 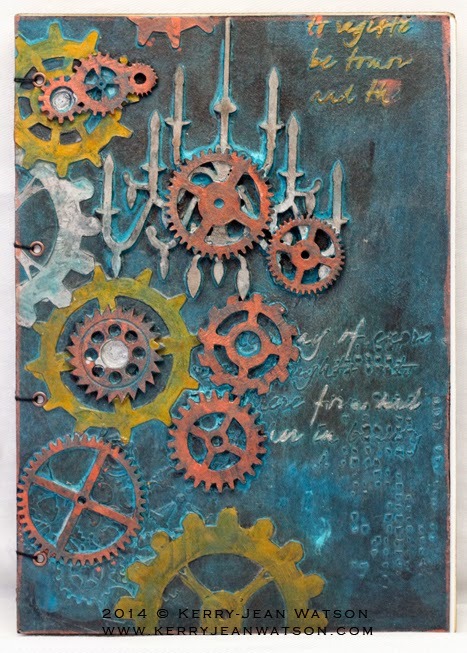 I made my selection from Meg's Gardens very own Tim Holtz Studio category. 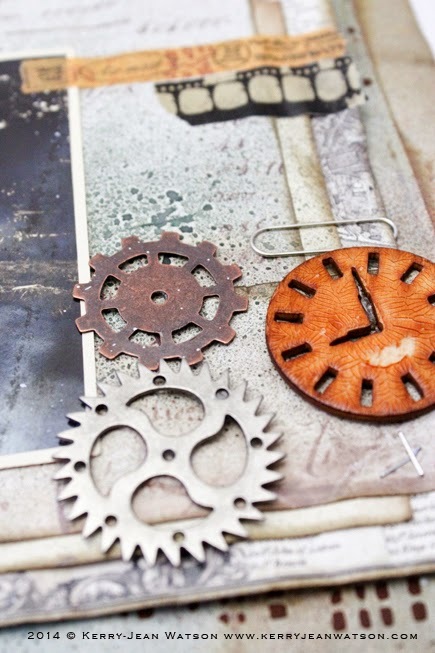 Choosing Mini Gears and Word Brands, Pen Nibs, Film Strip Ribbon and Ornate Plates. 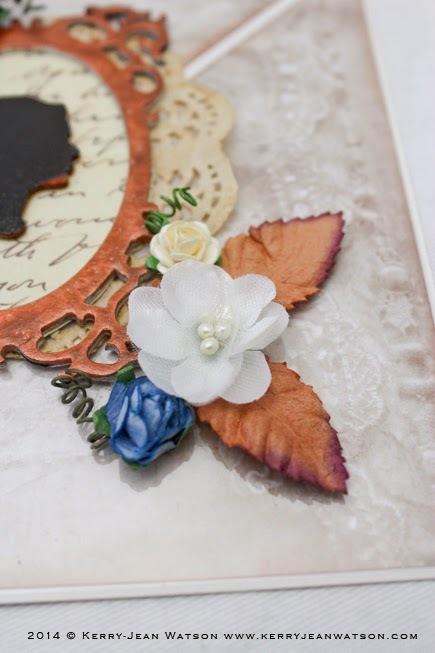 I also threw in a few of Finnabair Vintage Trinkets from Prima that I had left over from a previous project. In the background of the first tag you will also see a little bit of a vintage Advert poking out the side, this is from the Transparencies section titled Ink. I really do love using transparencies in my work, as you can see a clock face which comes from Old World Time Transparency as well. The writing ephemera on the second tag is from the Correspondence Cut & Create. The mini bottles are also available from Meg's Garden where she has a good range to choose from. These next two tags, as you can see, are a bit different from the first. I have fussy cut the image from the mini pack page stuck them down with some foam tape ( which you can't really tell with these photos). 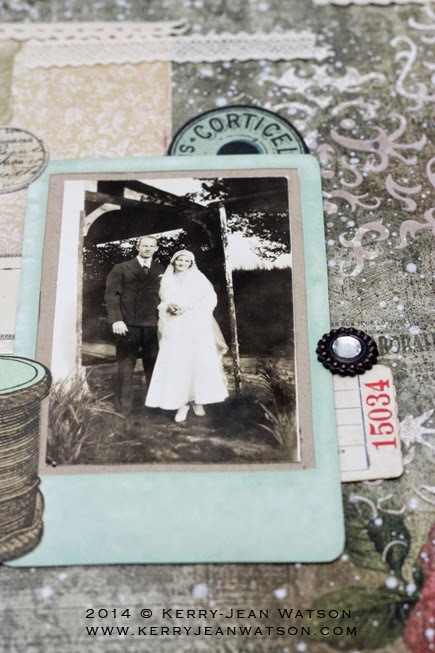 Behind the both cut outs I added the lovely vintage ephemera also from the Correspondence Cut & Create. 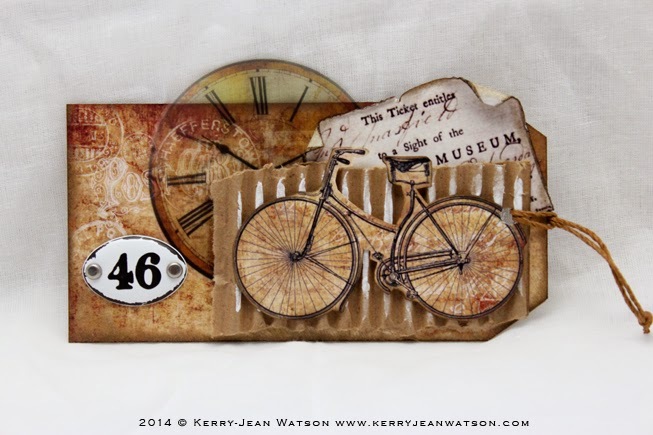 There is another clock face from Old World Time Transparency and some of Tim Holtz Film Strip Ribbon. 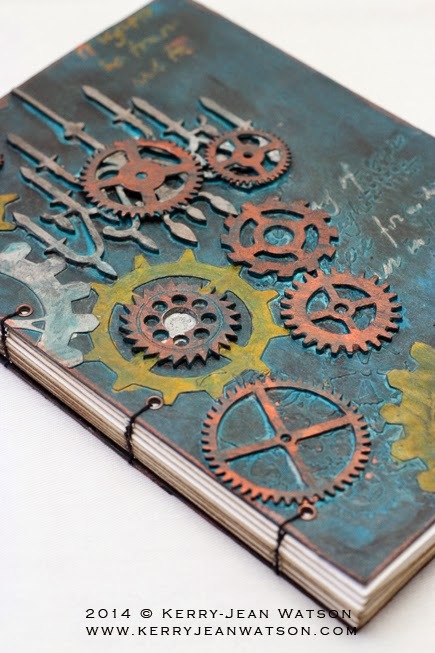 I added one of Tim Holtz Keyholes on one and a Pen Nib on the other to enhance to whole look. 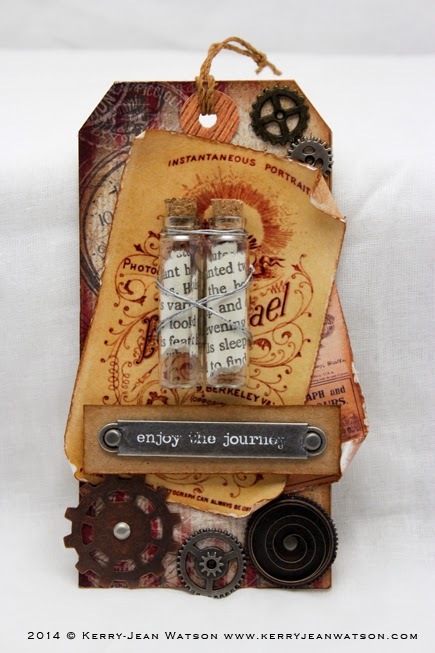 For these last two tags I used similar items to the first 4 but added the corrugated cardboard to add some dimension and again I have snuck in another Tim Holtz Plaquettes to add to the grunge look. Some of you will know that I was not born in Australia, but instead South Africa. In 1993, things in the country I was born, became unstable and, to put it bluntly, terrifying. My parents had started making plans of immigration out of South Africa to initially New Zealand. The social implication of which caused us to be ostracized, My brother and I especially as we were at school at the time of this decision. I did not attend school in 1994, which at 15 was a very big disruption to the routine of my life. 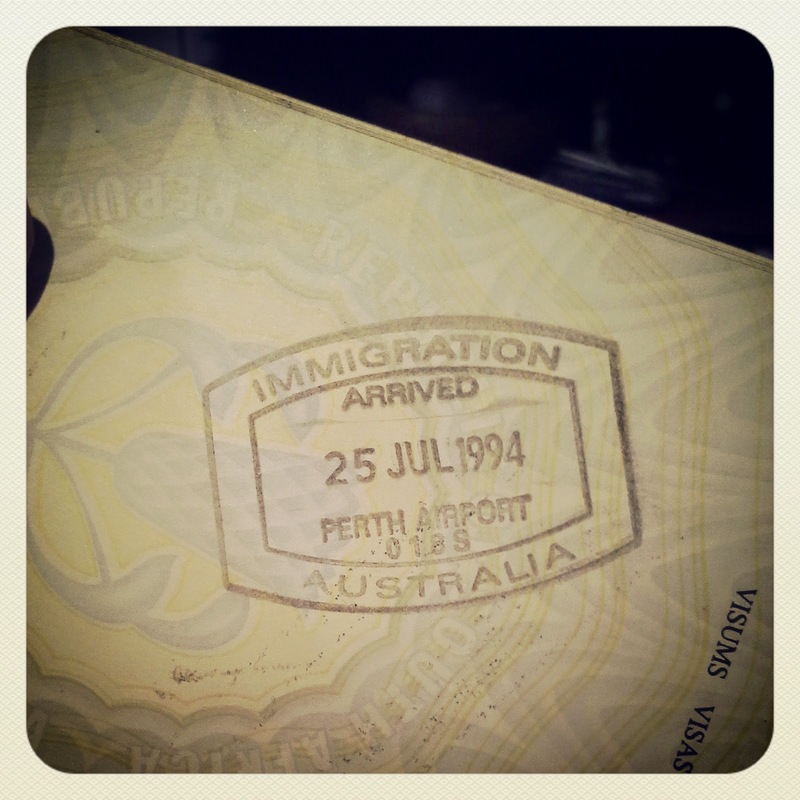 In April my father and brother left for Perth, Australia while we waited for immigration applications. My mother and I stayed behind until our house could be sold, meanwhile we lived with my paternal grandparents. Unfortunately my grandmother health was declining and the doctors had sent her to hospital for test. I saw her the first day she was there, and helped her get settled in. I am a bit hazy on the timetable of what occurred but one morning when they were preparing her for a scan she became very ill and exploratory surgery was arranged. For many years my grandmother had been told she has a hermia in her bowl which was the cause of the pain and digestive issues she had. This surgery proved that to be very false. A 1 kg tumor was found on her bowl. Around this time my parents had to leave the 6th floor apartment they were staying in and move into a retirement village type arrangement. While my grandmother was in hospital we moved there belongings, at the same time my mother and I prepared ourselves for our departure of South Africa. The night before leaving I was watching a broadcast of the Shoemaker-Levy 9 Comet's last fragments smacking into Saturn's surface. This was the day before my mother and I was scheduled to fly out. While I was watching the celestial wonderment, my mother was out with my grandfather visiting my grandmother. When they returned, I was told that my grandmother had not recovered from the surgery and had passed away. I cannot recall how I felt, there was just so much going on. It was a lot to take in as a lot had taken place in such a short time. The following morning we were up and ready to go, I remember my mother making the statement the we could stay a few weeks longer and help with arrangements for my grandmothers funeral, but with all the political unrest my grandfather just wanted to see us safe. He insisted we keep to the plan and fly out that morning. First time I cried was when the wheels of the plane left the ground, that was the moment of realisation that we were leaving and nothing would ever be the same again. My childhood as I knew it was well and truly over. From Port Elizabeth we flew to Johannesburg and from there a 9 hour or so flight to Perth. We landed at some ungodly hour of the morning, it was still black out side and it was COLD. And here I am 20 years later, so many adventures and learning curves, heartbreak and discoveries. I would not trade any of it in for a second. I have all these old photos of my maternal grandfather who was born in 1905. There aren't a lot of photos of him as a young boy but a lot of him as a young man. I just love this photo of him relaxing in a garden chair in a suit. 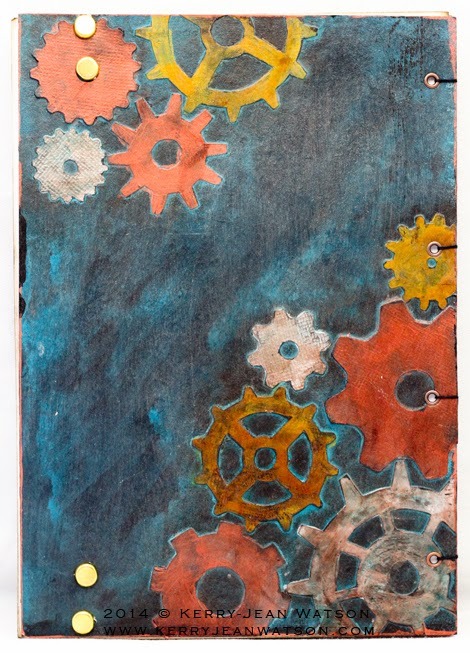 I used the Correspondence Collection as a base for the background and paper stack. I added some coloured texture paste and sprayed some watered down gesso over the background. There is some of the wondrous Dodo Vine Wire in the background which is awesome to use. 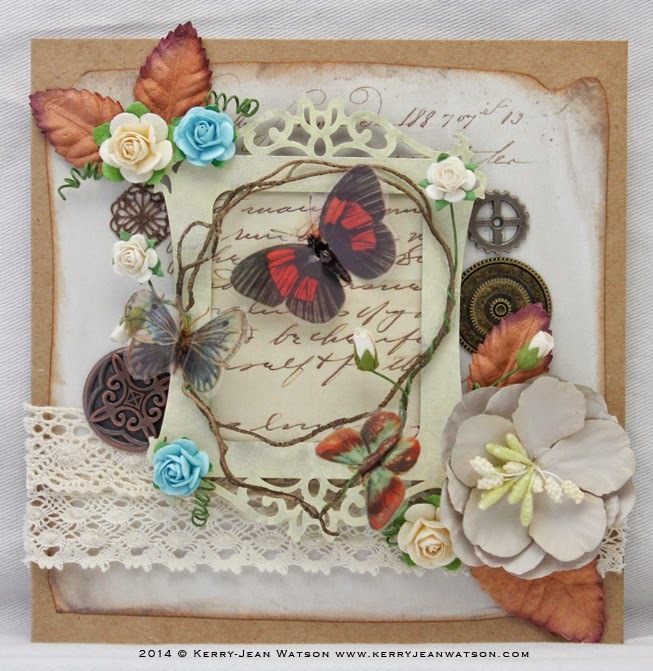 I love using Finnabair Vintage Trinkets- Gears too I couldn't not passed including them. 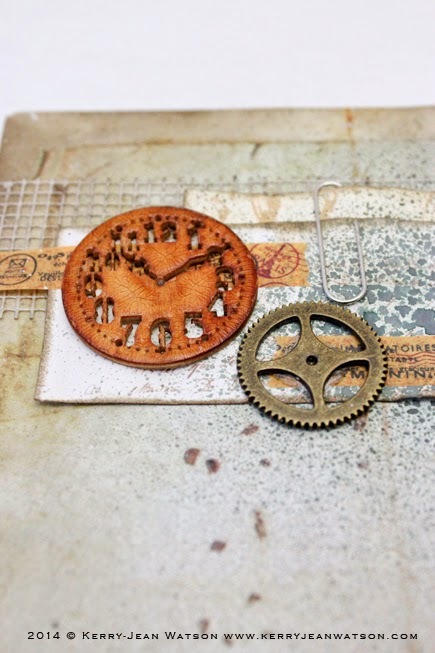 I added some Postmark Washi Tape with some other washi tape I had on hand, along with some wood veneer clocks which were inked with some of Ranger's crackle accent. This layout will most certainly be added to my family album. 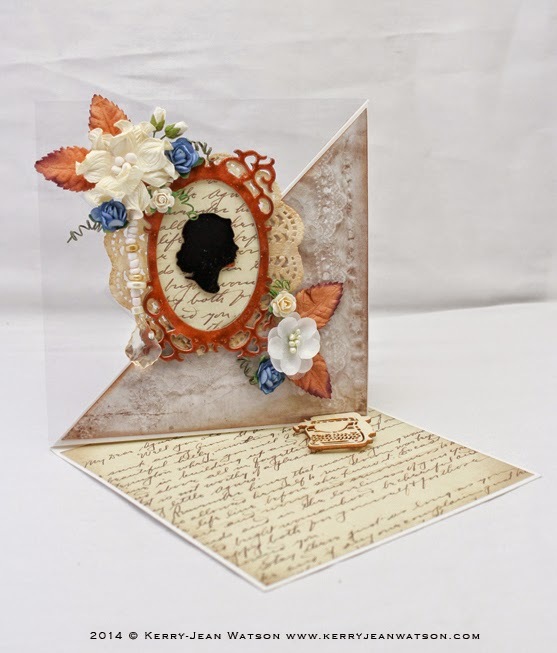 I haven't done a twist easel card with acetate for a while and I thought some thing pretty and feminine was in order with the Correspondence collection. I love these laser cut frames and painted one with some bronze paints to match witht eh Copper paper leaves I was going to use. I liked those blue paper roses from one of my layouts so I used those with some White mini rosebuds and a Gardenia for my flower setting. I used the Copper paper leaves because they fit so well with the colours I have used already. 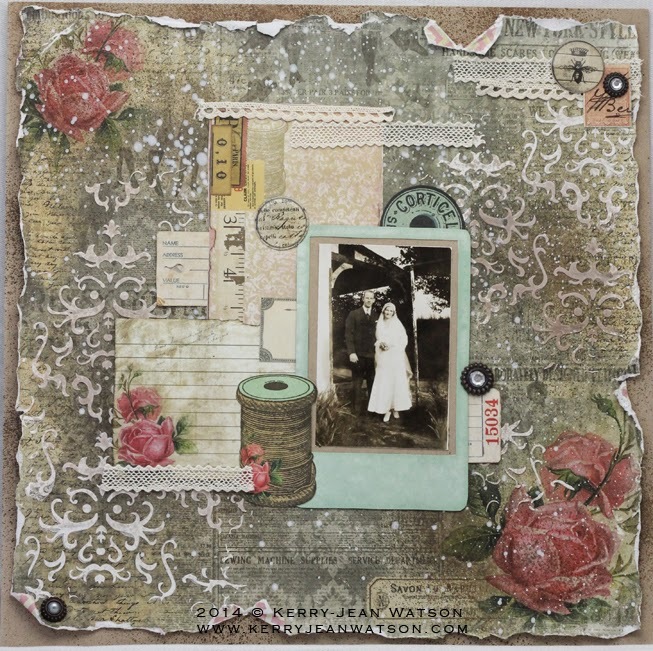 The cameo in the centre of the frame is from Prima Market and the tea stained doily is from my own collection. 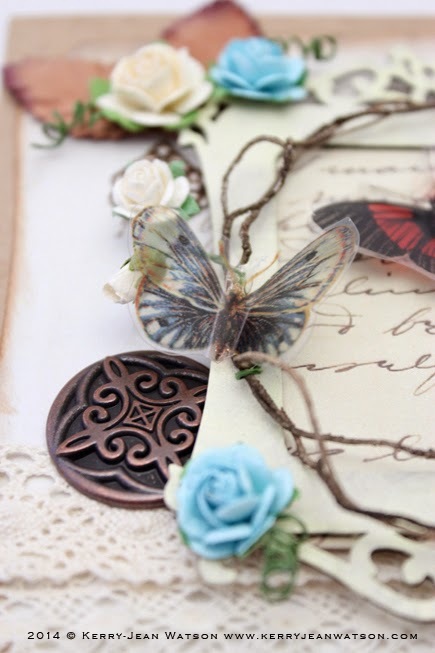 However there are some wonderful paper doilies available on Meg's Garden web store. I wanted to play with the Dodo wire some more and this card gave me the perfect opportunity. I have fussy cut out one of the pages from the correspondence collection and inked the edges. I had a lot of difficulty working out what color card stock to use and in the end went with craft as it wasn't going to overshadow the flowers and butterflies. I painted my laser cut frame cream and using some off cut paper filler the inside of the frame. The dodo Vin wire I loosely wrapped around itself in the size I wanted and then wrapped flowers around the Dodo Vine Wire. 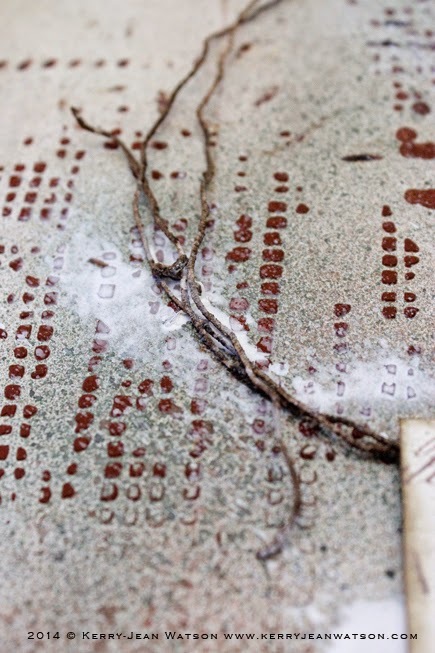 The Transparency butterflies were glued to the vine wire with Helmar 450 glue and holds very well. 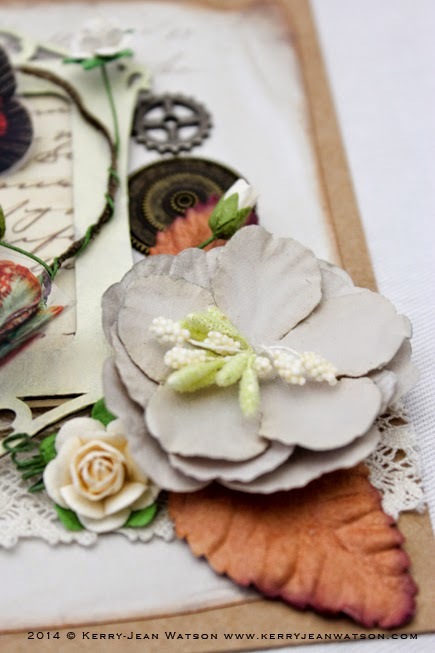 I added a few of Finnabair's metal trinkets, Tim holtz mini gears and a Vintaj Diamond filigree charm in the background to create a bit of contrast against the ivory paper flowers and the oatmeal coloured flower. I added the turquoise rose flowers (bl paper) for a little colour pop. Hello everyone. As I have posted on my blog about my experience with Irlens I thought I would talk about my experience with Cellfield, which is a remediation for Dyslexia. At the beginning of July I went for a Cellfield assessment, the results of which showed I have certain issues with reading and comprehension. This is nothing out of the ordinary as I was diagnosed with Dyslexia in 2012, which was also not a surprise. After having little long term benefits from Irlens I looked at what else I could do in terms of neuroplasticity. Cellfield was recommended and I did some research in to the program. Like Irlen there were many who reported great improvement in their childs processing but there were the occasional case of there being no change to a child reading and comprehension. Finding information on adults who had done the program was not very fruitful, but I figured if it was being recommended to me then it is worth a try. I saw more benefit in try than just struggling and carrying on the way I have for 35 years. I really did not know what I was in for really, but my mind was put at ease and I dove right in. I did the program over five days with two, one hour session each day. The program is a visual and auditory base program with forces your brain to see passed the distraction or obstacles. In simple terms, I was looking at a screen that had dots appearing and disappearing and then either straight or waved bars tracking from one side of the screen to the other. Amongst all of this, I was directed to find words through the headphones I was wearing. Added to all this I had to wear special glasses, some sessions one eye was patched others one eye has a red lens. The first session was the hardest, mostly because there is no preparing yourself for the experience. I was really really tired and also famished (this is because I had burnt up a lot of brain fuel which is glucose). The rest of the sessions followed suit in terms of my coping, although by the 7th session I wasn't getting as exhausted after the sessions. What I did notice was about the 4th session I had noticed I wasn't using a process of elimination to find the words, but was actually looking for the word needed. Also I have used a decoding method for my B's and D's especially in lower case, which I noticed I wasn't having to use after the 4th or 5th session. There was an automation to my brain looking for a word I was directed to find. Then we come to pigeon english. The most intensive section of the program for me was the pigeon english. At first I did ok as I was able to decode the pigeon sentence with little difficulty. By the 6th or 7th sessions I was reading the pigeon sentence like it was normal text, was freaked me out a little. Mostly because I was, at that point, very aware of the neuroplasticity that had taken effect. The best part was the final session where I didn't get anything wrong. Overall a grueling experience but well worth it. A nice little side effect is that since 2012 I have been wearing prescription specs, which I don't feel the need to wear any more. Also any visual symptoms I had with irlen Syndrome are not apparent any more. I go in for my post Cellfield assessment next week with the hope that there has been measurable improvement, but I feel there has been I just cannot articulate it apart from language connection being easier. Hello all you crafty bloggers out there. 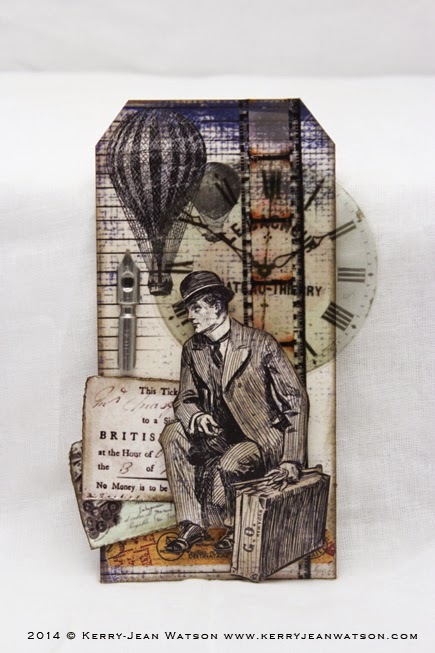 I recently created The Gentlemen Collection for Meg's Garden. I was looking for a grungy vintage masculine paper collection but I couldn't find what I was wanting, so I decided to create one. My grandfather who was born in 1905, and I have many old photos of him as a young man in the 1920'2 and 30's. 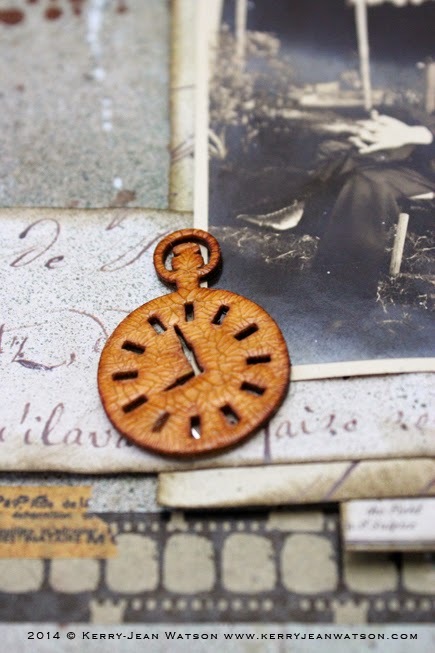 I wanted a collection that would compliment the world around him in those times, where things weren't smooth and perfect, but ages and textured and had the weight of having been around for a long time. As there were no televisions in those days people would entertain themselves by writing letter or in journals and most of all travel. Whether it was over seas or a days trip somewhere, exploration was a large part of life back then for some. 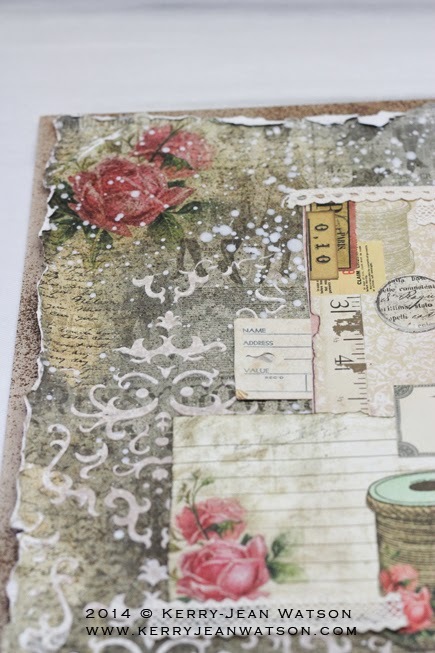 With these things being my inspiration and direction I looked at working with texture and the look of aged paper. 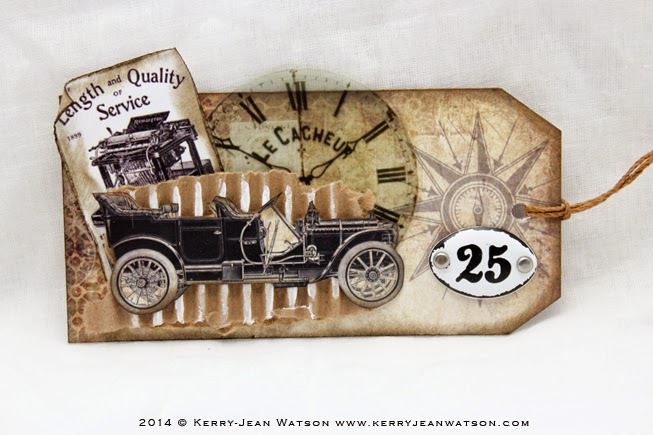 I found some wonderful masculine vintage graphics to include in the designs, the old Automobile is one of my favourites. I have also become rather enamored with element pages with small graphics that can been cut out and used in layouts and cards. I went looking for some Cabinet Cards which were popular in the 1870 to add to the Ephemera page along with some other appropriate graphics. The collection can be found over at Meg's Garden HERE. I hope you like the collection and have some fantastic ideas for using it.